Selected poems and quotes by Sri Chinmoy. Replaces the love of power. Love is not a thing to understand. Love is not a thing to feel. Love is not a thing to give and receive. a slave to the outer reality. The sun shines for everybody. Of it and some people do not. Try not to change the world. Try to love the world. Lo, the world is changed. To disturb your inner poise. Sri Chinmoy, When God-Love Descends, Agni Press, 1975. Sri Chinmoy, Peace, Agni Press, 1995. Sri Chinmoy, Ten Thousand Flower-Flames, Part 17, Agni Press, 1981. Sri Chinmoy, My Christmas-New Year-Vacation Aspiration-Prayers, Part 33, Agni Press, 2005. Sri Chinmoy, I Meditate So That, Agni Press, 1982. Sri Chinmoy,Seventy-Seven Thousand Service-Trees, Part 15, Agni Press, 1999. 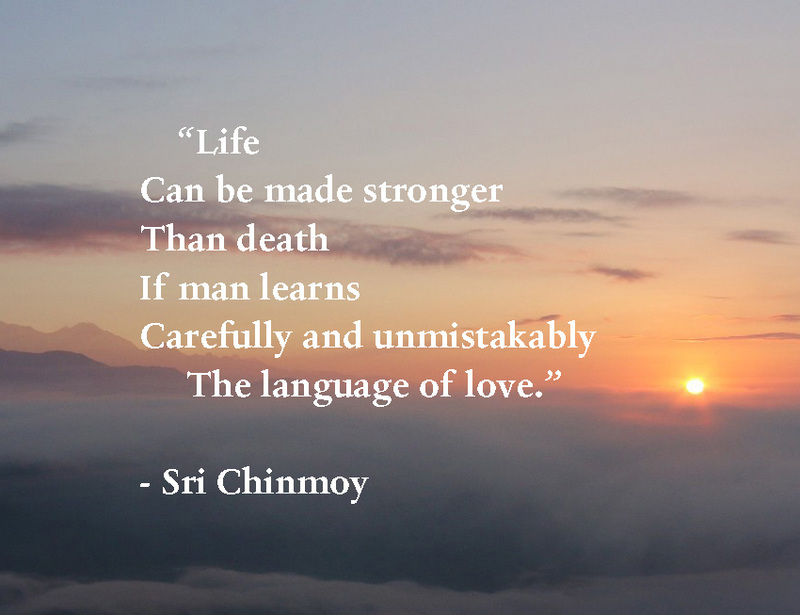 Sri Chinmoy. Philosopher-Thinkers: The Power-Towers Of The Mind And Poet-Seers: The Fragrance-Hours Of The Heart In The West, Agni Press, 1998. Sri Chinmoy, Meditations: Food For The Soul, Agni Press, 1970. Sri Chinmoy, Yoga And The Spiritual Life. The Journey of India’s Soul., Agni Press, 1971. Sri Chinmoy, Ten Thousand Flower-Flames, Part 78, Agni Press, 1983. Sri Chinmoy, Seventy-Seven Thousand Service-Trees, Part 39, Agni Press, 2004. Sri Chinmoy, Seventy-Seven Thousand Service-Trees, Part 33, Agni Press, 2003.